Interesting - I didn't think of dropping down to class 3 shields, and 228T vs 284T is a bigger difference. I found a table somewhere that shows that 3A shields on a python beats 6A shields on a Clipper - I didn't know that. However, selling my Clipper and buying your Python now would only leave me with 5 million credits on a ship with a 2.5million insurance cost. That's too close for comfort, so I'll wait a week until I get another 5 million from power play and buy it then. I'll be sorry to see the Clipper go, especially since I bought it during the Empire Rank amnesty (I'm one rank away from Baron) and will need to do lots of missions to get it again. 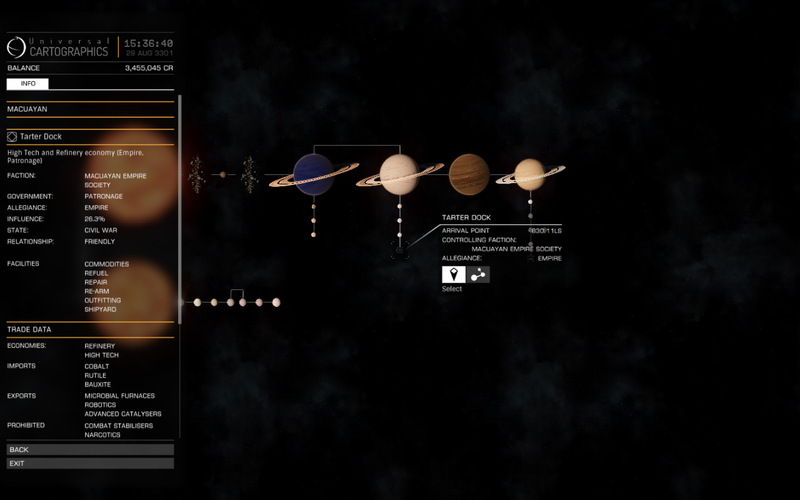 Why the Type-9 hatred? 500T of cargo space is a serious plus. If it was me I'd just keep the Clipper and earn enough money to where I could buy a Python eventually without selling it. Sounds like you really like the ship. Yeah, I definitely feel that -- I had a hard time letting mine go too, especially since it's out of the price range where I'd just keep one around just to have it. That said, once you are making Python money (and especially when you are making Anaconda money) it's not too long before you could consider it if you really wanted to. It is big, cumbersome, and not fun to fly (I've played with them during beta periods). It is also very slow, both in terms of jump distance AND non-relativistic speeds. Really, really slow. 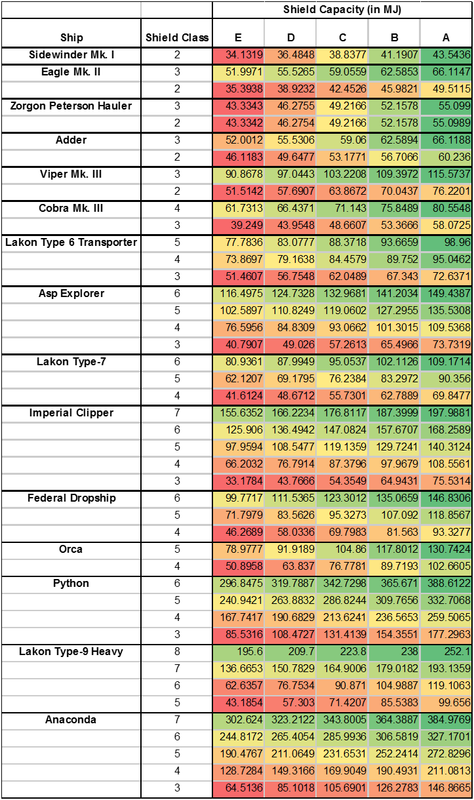 The Anaconda isn't terribly fast in non-relativistic speeds but it still is faster and handles better than the Type 9. Also, it has a comparatively HUGE jump range. So when you compare them in terms of total time needed to run most good trade routes, the Type 9 often ends up being less profitable in credits per hour, despite the not insignificant cargo size increase. Further, a Type 9 is like a big flying buffet for pirates, whereas an Anaconda -- even a very obviously trade specced Anaconda -- is not easy prey. Check that shields table, then account for the fact that you very comfortably fit and power eight shield boosters, multiplying that by 160%. 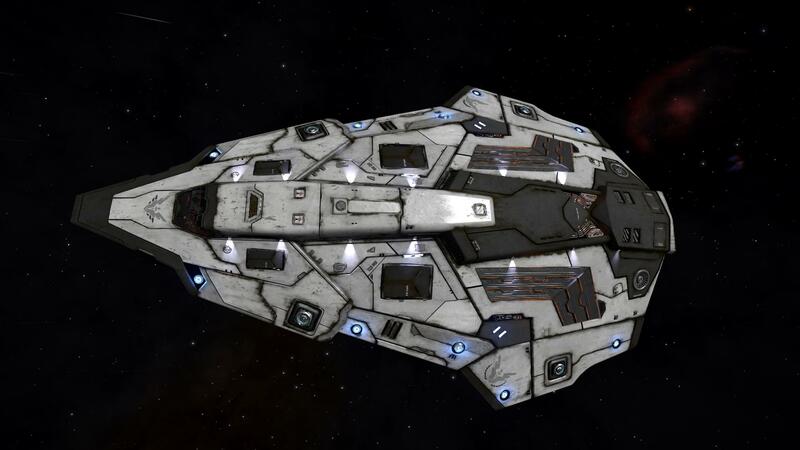 Also, I believe only an Anaconda can mass lock an Anaconda, whereas a Type 9 can can be locked by an Anaconda or a Python, and hindered by an FDL. 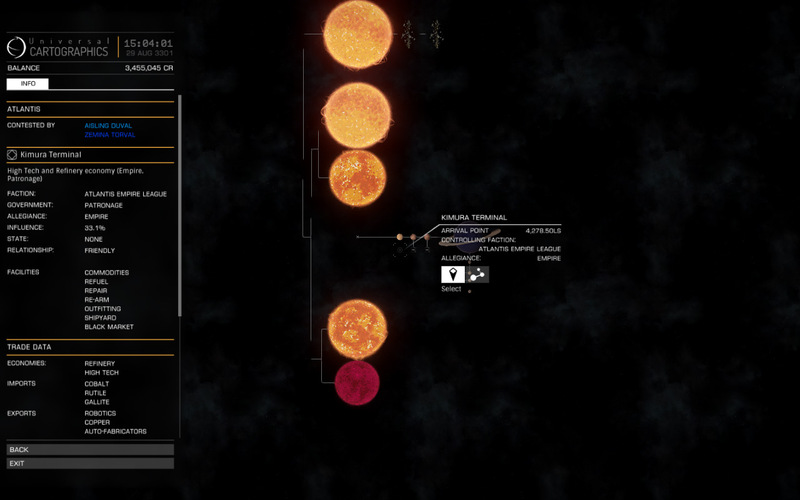 But yes, if you find a few perfect routes -- i.e., tiny jump distance, huge profit -- a Type 9 will fill your bank faster. Of course, that's also not accounting for the process of finding new routes when that perfect route eventually dries up -- a process that will be a LOT more pleasant in a ship than can jump 30+ ly unladen, and over 18 loaded down. I think I have lower jump range expectations than you do Zero. 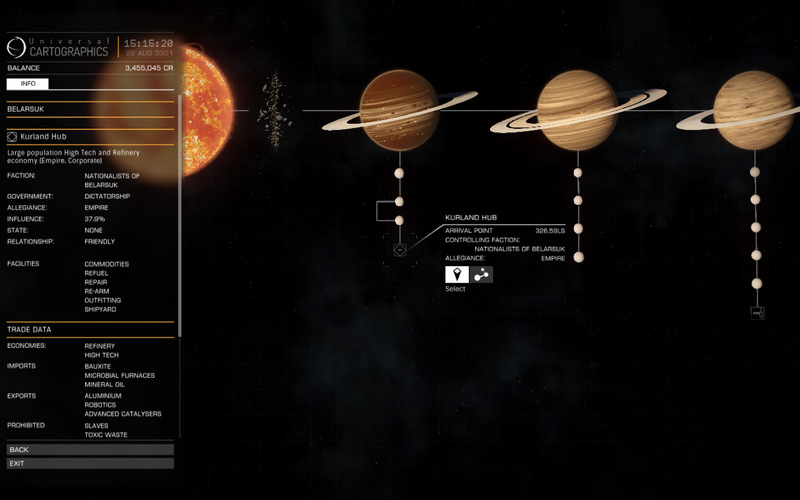 The 13ly jump range doesn't look too bad on this Trade Type-9. My current Clipper can only do 13ly fully laden and it's not a noticeable impediment getting around (it's the supercruise section that takes the time rather than 6-7 jumps). 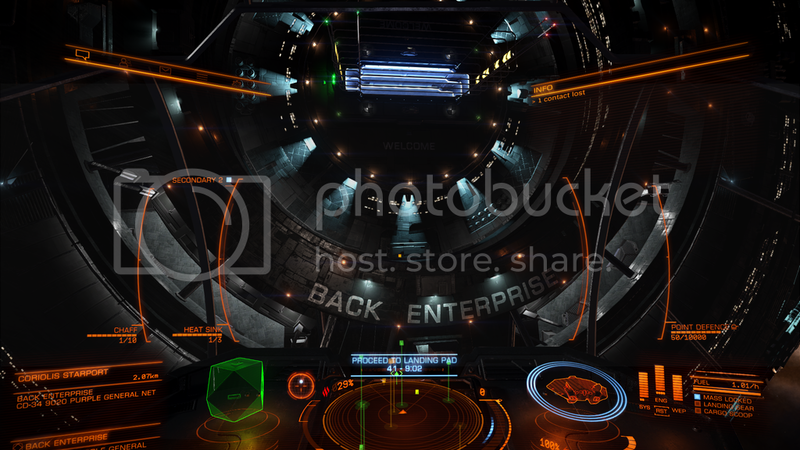 I am using it for background 5-mill-a-week powerplay rather than actually trading (apart from on the way back from delivering control supplies) though. I never get successfully interdicted if I don't fancy a fight, so pirates aren't a problem (and in fact it's usually PP enemies that try and interdict me rather than pirates). I mean, it's certainly a matter of personal preference, but a difference in jump distance of 5 ly really does open a lot more opportunities with the way it reduces travel time. 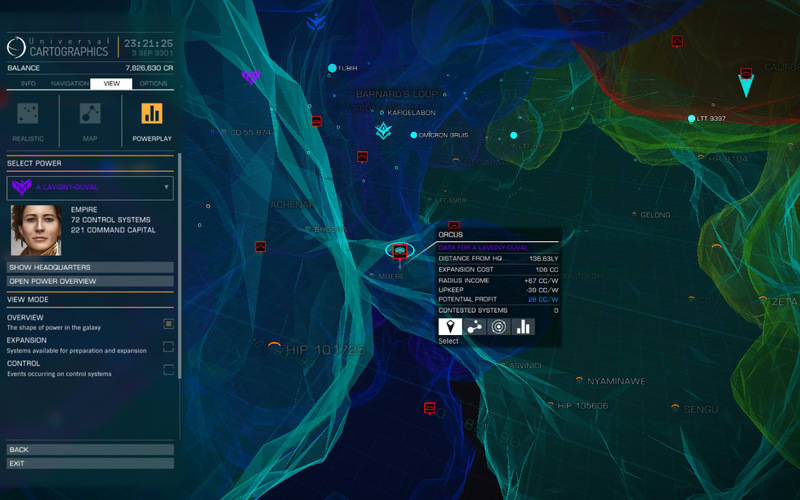 Maybe the better question is what is the trade route expectation? 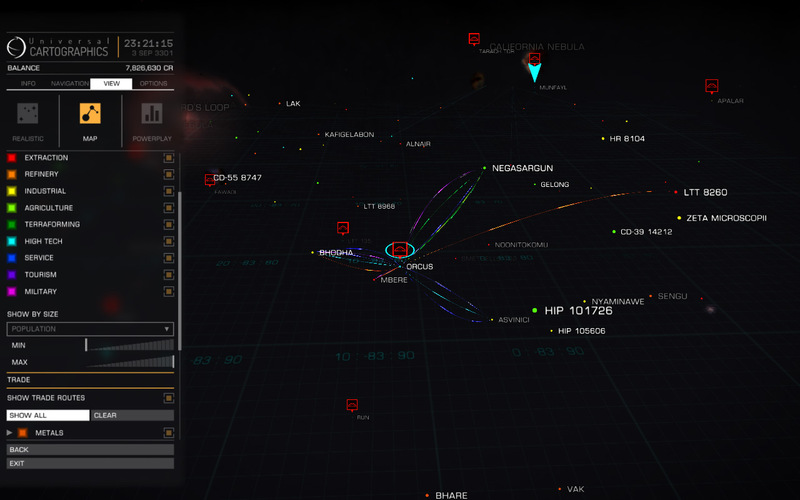 I fly a hybrid Python so I can only move 200t with a 14ly jump and its pretty frustrating, but the routes I fly even losing that 1LY would turn a 2 or 3 jump route into a 3-4 route jump, and while I'm sure they are out there I have yet to find a route that pays 4000+ / ton round trip with less than 20ly jump, and those involve outposts, so not applicable to Clipper or Type 9. 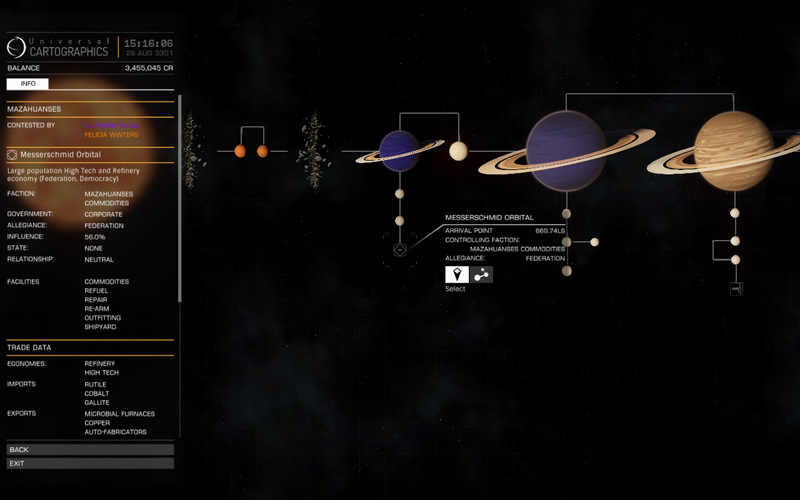 If I'm taking more than 3 jumps I'm expecting at least 4000/ton profit. 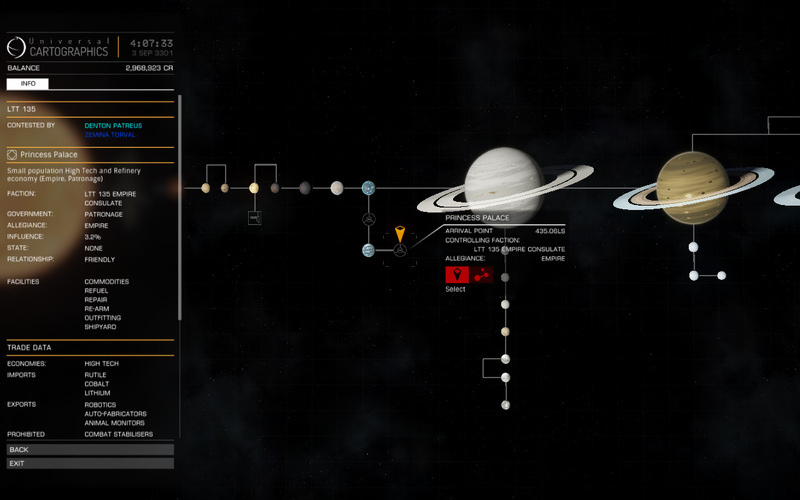 Speaking about outposts, you get out of mass lock a lot sooner from an outpost than a station so if you're counting down the minutes, you save a lot of time over the course of an hour. But as others say, if you like a clipper stay with a clipper. 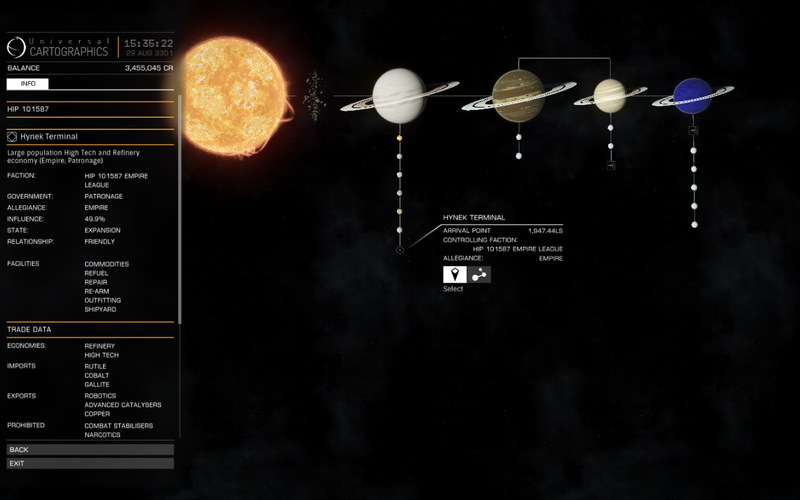 I was strongly considering one but went straight to the Python really because of the ability to land at an outpost. Next stop for me would be a tradaconda, but that Federal Assault ship really looks awesome. OK, here are my proposed suggestions for systems to establish the minor faction in. The is a map from up and anti-spinward, looking at the human space column from the side. As you can see, I favoured ones that were a bit more centrally located, with the caveat that they're mostly uncontrolled by any PowerPlay faction. Here's a version without the powerplay colors from the same angle. Ind. High Tech / Refinery. 9 ls. Outfitting checks out. 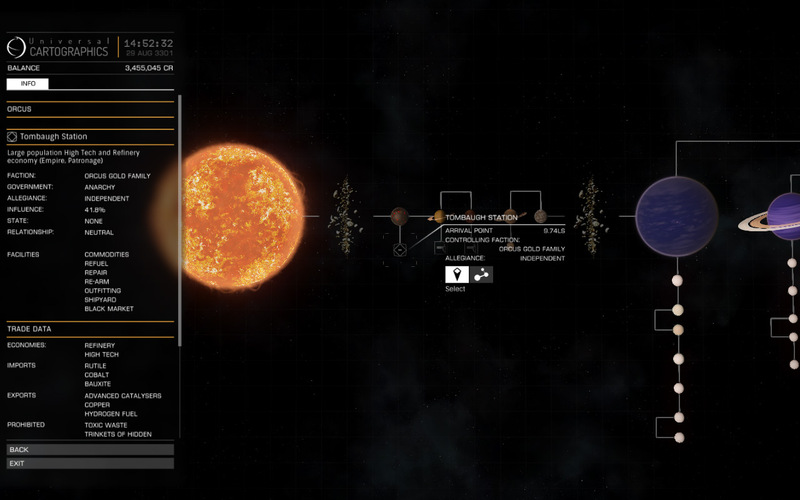 Station within 30 ls of 5 RES. Superlow travel time. Station orbits a volcanic planet which looks impressive and should be interesting once volcanic planet landing is in place. It sits in the middle of a bunch of intersection on the core-ward side of human space. It's position in the galaxy is just outside Patreus and Torval's territories. 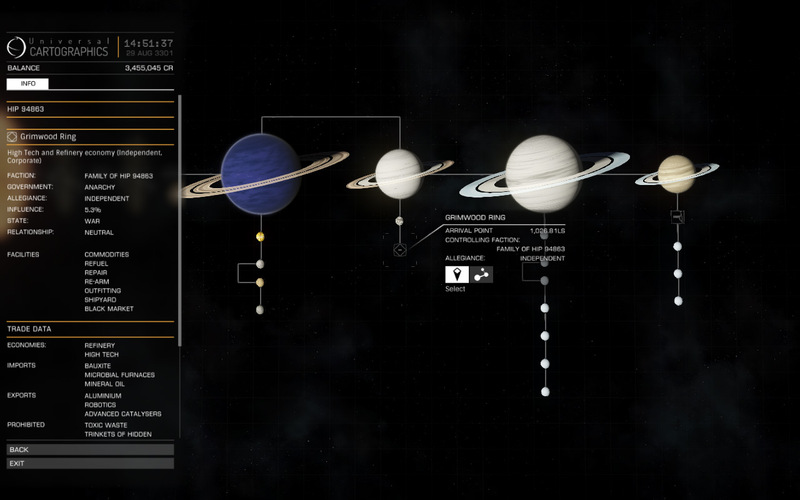 Here's what its nearby systems look like. 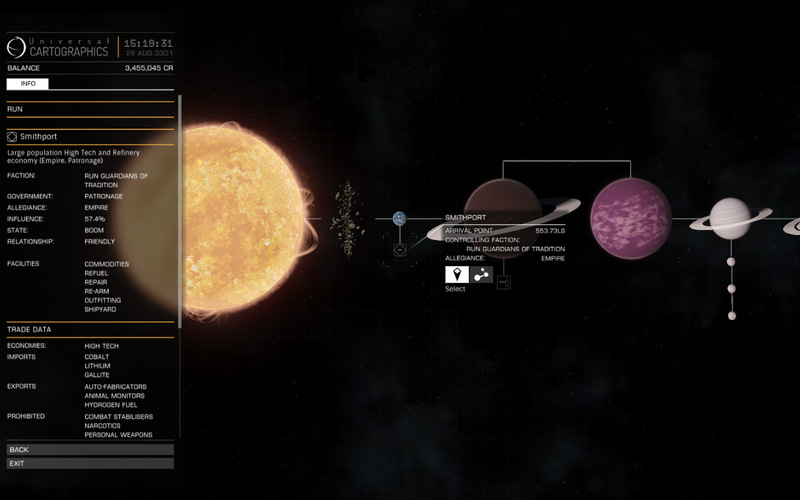 Near Kumo Crew pirate territory, in a bubble of unclaimed systems. 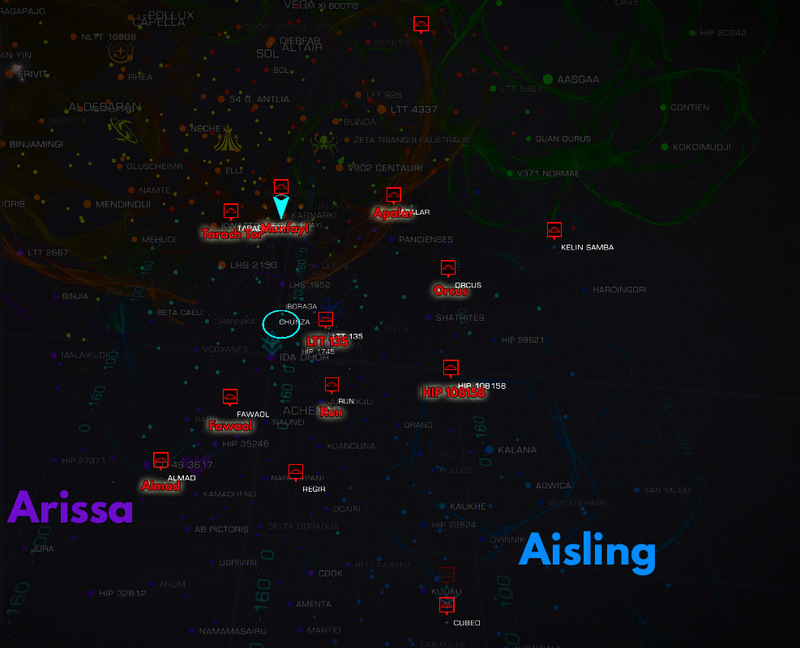 Nearest ALD system is Candecama, nearest Aisling system is Kelin Samba. Not too far from the edge of Hudson's space either. This is my personal vote, given the short travel time, RES availability, and closeness to a bunch of powers. Ind. High Tech / Refinery. 3126 ls. Outfitting checks out. Station very very close to RES. The long travel time makes this inconvenient if you want to regularly pop in and out of the system. 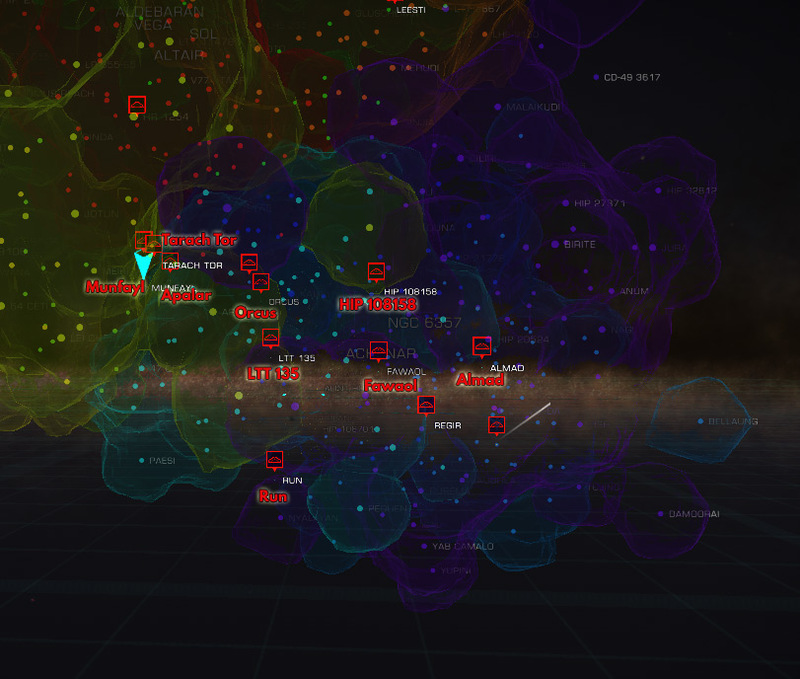 Very close to ALD's Candecama, hovering just beyond its exploitation zone. Also close to Patreus and Torval. Independant. High Tech. 359 ls. Near several rare commodity systems, and has one itself. In a pocket surrounded by Patreus, Torval, Hudson, Kumo Crew, and Utopians. 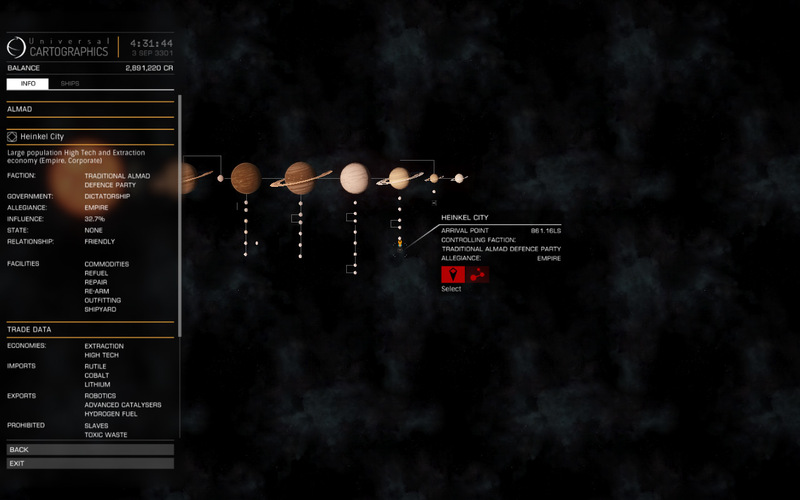 Not too far from HIP 108158. Empire. High Tech / Refinery. 466 ls. In a large unclaimed region on the coreward side of human space. Closest to Patreus, Torval, and Mahon. Near-ish to Kelin Samba. Empire. Extraction / High-Tech. 861 ls. Between ALD and Patreus, rim-ward from Empire capital. Right on the edge of Kumo Crew pirate space. Empire. High Tech / Refinery. 326 ls. In a tiny pocket between ALD, Mahon, and Winters. Just outside Lugh's exploitation zone, Expect Crimson State Group activity eventually. Empire. High Tech/Refinery. 553 ls. Outfitting adequate, not great. Several RES. Ind. High Tech / Extraction. 215 ls. Disappointing outfitting. Interesting location in the galaxy. Close to Patreus, the Kumo Crew, and the Utopians. Empire. Agriculture / Extraction. 621 ls. Nice system, but outfitting inadequate. I can't buy anything heavier than an A3 powerplant. Federation. High Tech / Refinery. 669 ls. Empire. High Tech / Refinery. 830 ls. Outfitting checks out: can buy A6 modules. RES about 50 ls from station. Ind. High Tech / Refinery. 1026 ls. Empire. Extraction / High-Tech. 1044ls. 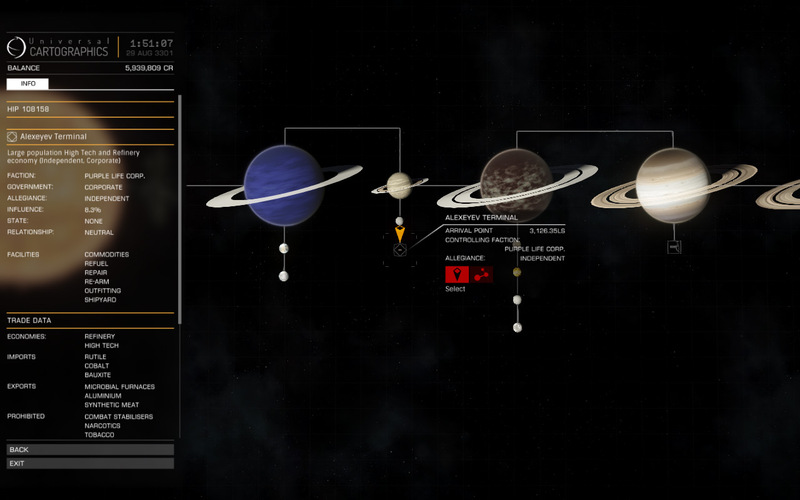 No ringed gas giants. Hence no RES. 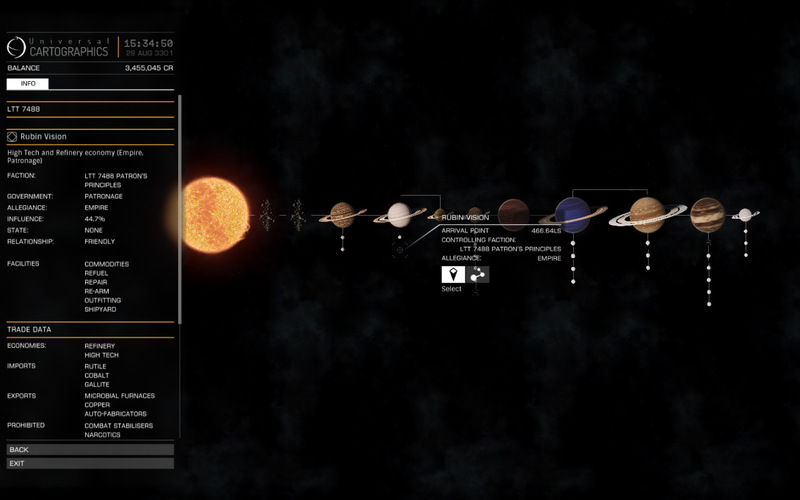 Close to Achernar and the core systems of the Empire. Empire. High Tech / Extraction. 1620 ls. I like the volcanic planet. Empire. High Tech / Refinery. 1947 ls. Outfitting checks out. 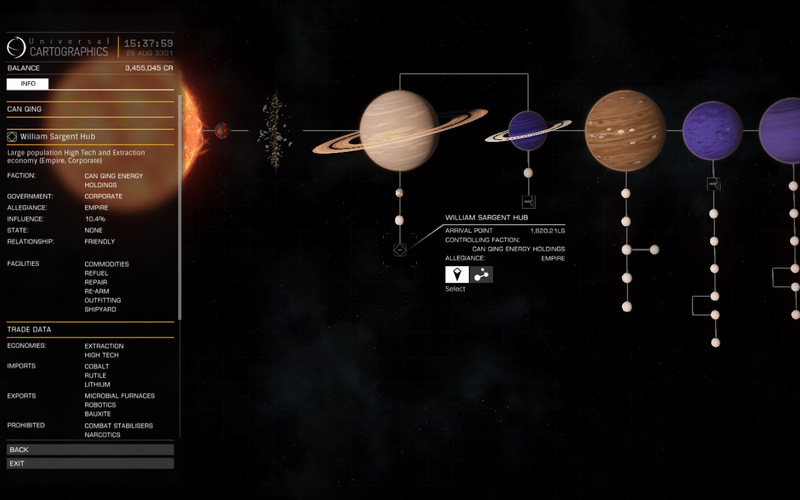 RES are 116 ls from primary station; there's an outpost closer to two of the RES. Empire. High Tech / Refinery. 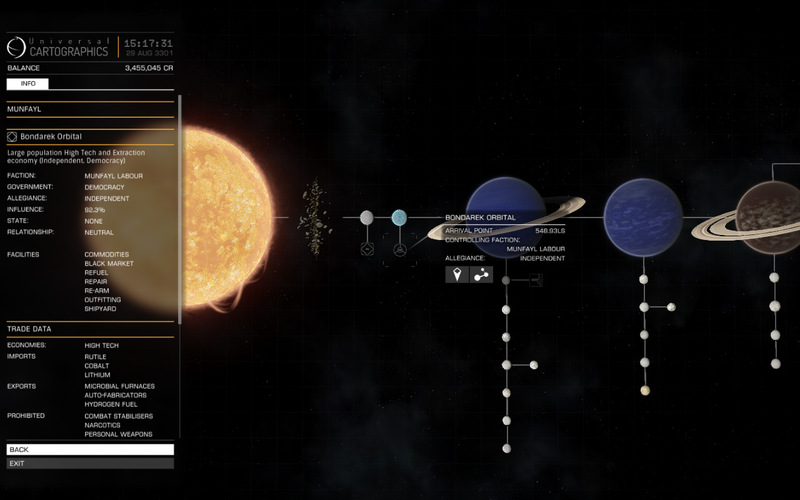 4278 ls. 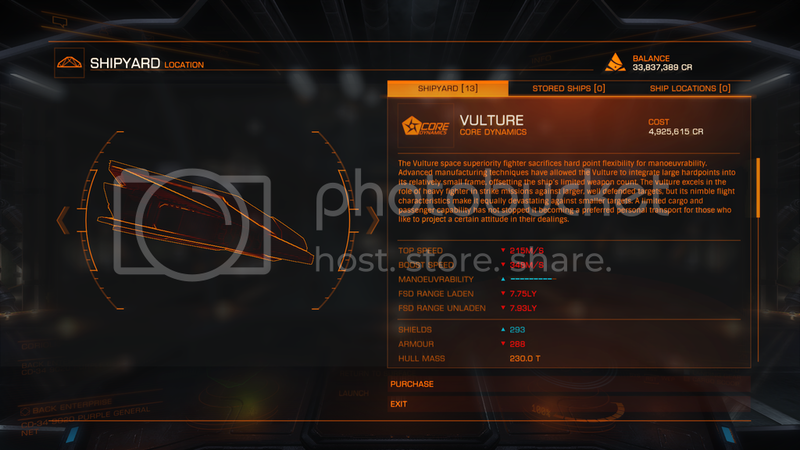 I tested the outfitting with my asp, so your Vulture, Python, or Anaconda may have more of an issue, depending on what you need. Now, there's also a catch with the outfitting, even when in a maximum-supply system: some of the powerplay factions give cheaper outfitting in their control systems, so there will always be a better deal elsewhere for part of what you might want. Frontier is a great company. I was coming here to post this bit of humor from Galnet, but then the room got all dusty. Wow, that was very sad and touching. His mother was not much older than me. The Hutton Mug item was funny. I've been to Hutton before (in this game and in both the previous games). Despite that, I think I'll make a run there tonight, in Open. Wave if you see me! Out of idle curiosity I was looking at the PP map. WTF are the Utopians doing over there in Takurua? Maybe they have a spy planning their expansion. This is where I've stopped for the night. I haven't been here in quite a while! I am so tempted to do this and go have some pew-pew fun. How much does it really cost to outfit this little gem? I could sell my Asp for about 18M CR, but wouldn't mind keeping it either. Poking around, I think we've found the roleplayers! There's a little bit of arguing about if it's worth the cost, but the more pragmatic Utopians have come around to accepting it as a buffer system if they should happen to go into turmoil again, and the roleplaying Utopians seem to be fond of it. My first Vulture loadout was this, IIRC -- about 10 MCr, and a lot of destructive fun. 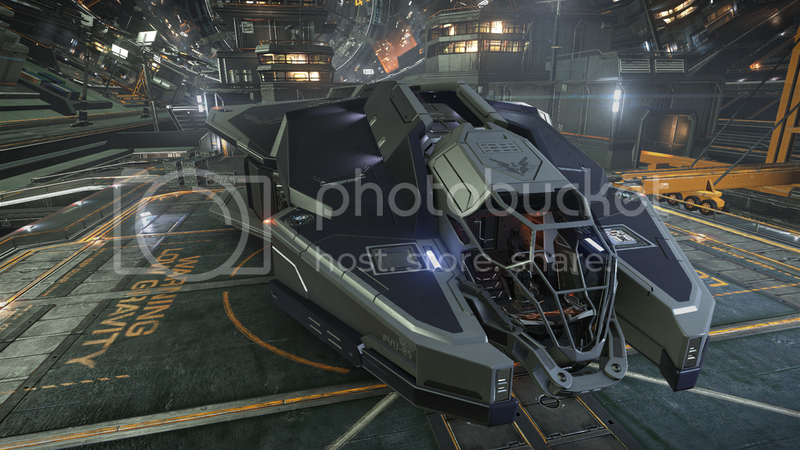 I just recently kitted out another one more expensively -- 5A thrusters make a very nimble Vulture! Specs are something like this, cost about 20 million -- still within your budget without needing to sell the Asp. And this evening, I should have some time to play again! (It's been a little while.) I think I shall visit BD+26 2184 to pay my respects, then pick up a book and fly to Sutton Orbital for the first time. The Alpha Centauri run takes about an hour and a half or so. Make sure you bring enough fuel! Also, large ships can't dock there, so the biggest useful ship is a Python (not a Clipper). 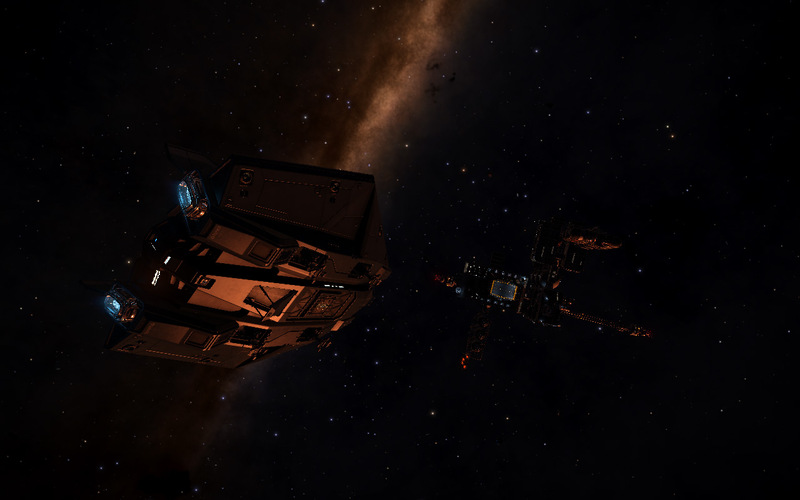 Though there was one guy who took a Type-9 there and was handing out extra scrap metal. I went in open and there were several people in the instance when I finally arrived. 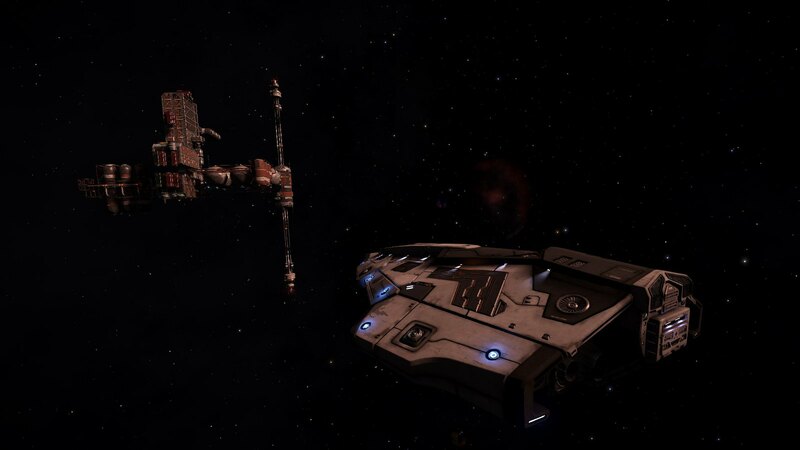 Check out one of the surface defense ‘Skimmers’ that will be coming in Planetary Landings, the first installment of Elite: Dangerous Horizons. That looks crazy. Give me! 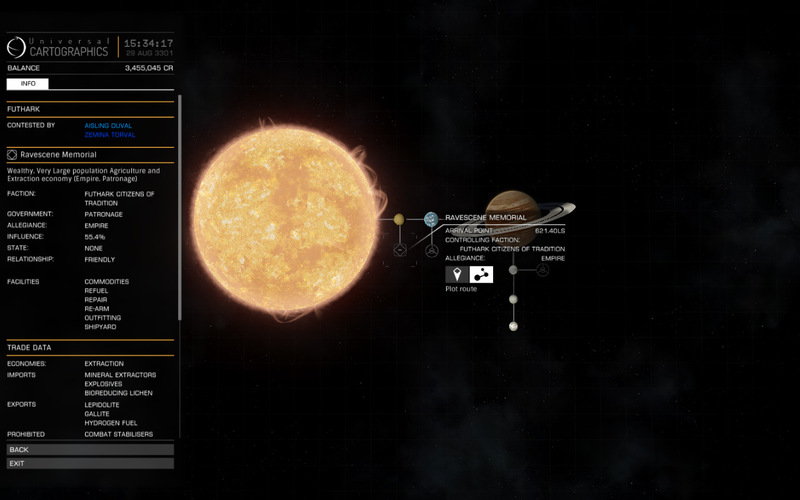 On the way to Hutton Orbital (which I typoed the last time I mentioned it -- oops), I lost communication with the server. And haven't been able to log back on. Grr. Cool, thanks. I think I know what I'll be doing when I get online later. If they were really roleplaying, it would be their only system. I'm finally in! Got my Saitek X52 all plugged in and done all the training. I know there's a private group. What's it called and how do I get in? I took it out for a quick spin in a local RES. I had not shot at anything in the past couple of months, so was a bit rusty at combat. 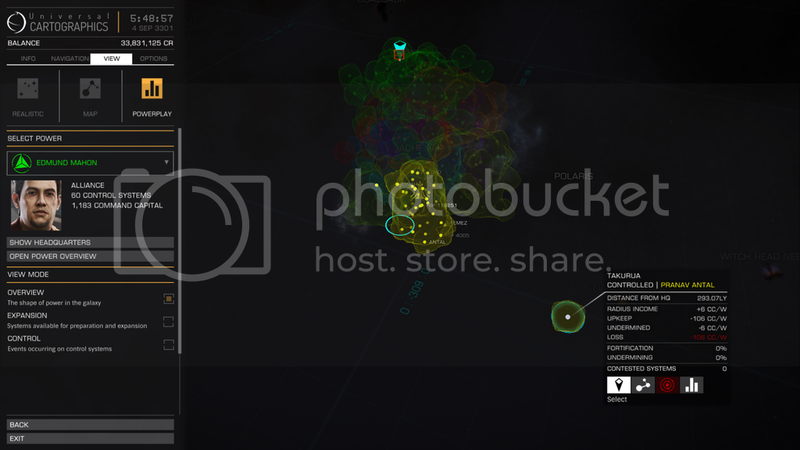 Still, this thing is a pirate murdering machine, so even I picked up about 170K in bounties within about 15 minutes. That's not much, given that I just spent about 20M on the ship, but it was fun. It's weird having so little visibility to the sides, compared to the Asp. It's also weird only having two hardpoints, even if they are large ones. Welcome! The private group is called Veloxi. Because it's Veloxi's. And should really go in the first post at this point. 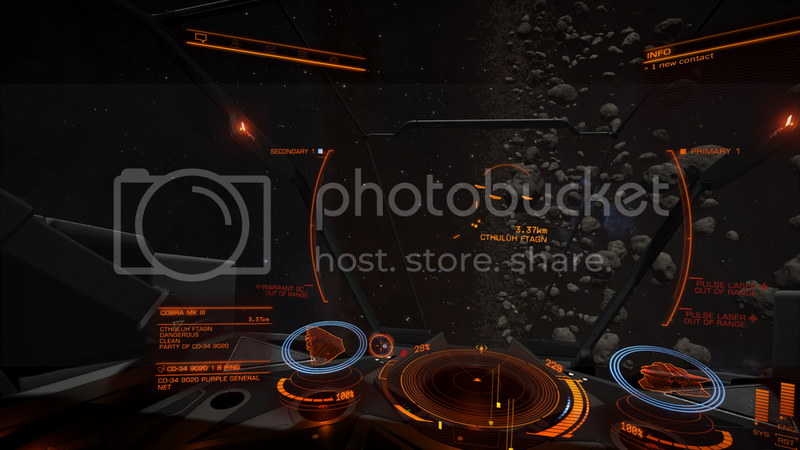 I got to Hutton Orbital last night! So my flying chops must be greatly improved since I played Elite all those years ago (30+!!) as I was able to dock first time without crashing!! ...but looking better than it ought to with paint condition at 0%. Saw an odd thing while bounty hunting tonight ... A group of authority Fed ships (the usual police types) jumped into the nav point and started fighting amongst themselves. They blew up one of their own Anacondas and a Viper. I assume somehow they aggro'd while chasing a pirate. Good thing this guy is Clean. 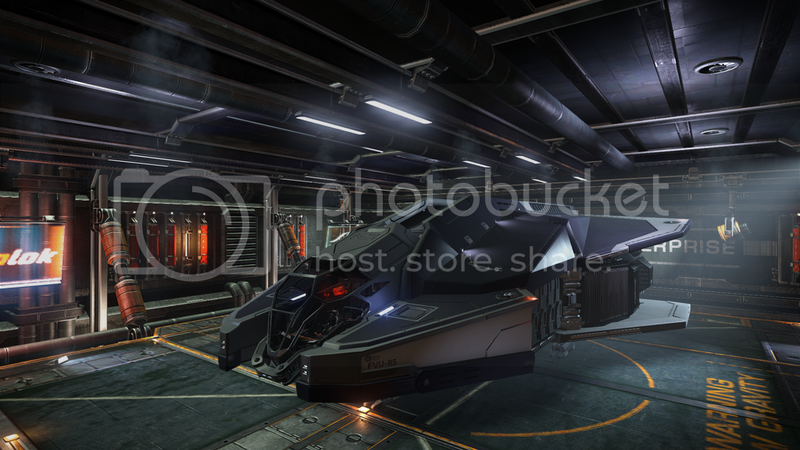 I'm beginning to like my new Vulture. I have to get used to the fact that if someone interdicts me, I should submit because it's essentially free money. I am still used to flying my exploration-spec Asp. I took my first Assassination mission today. It took me a few tries to get in position to interdict the guy, as he kept jumping in-and-out of SC. 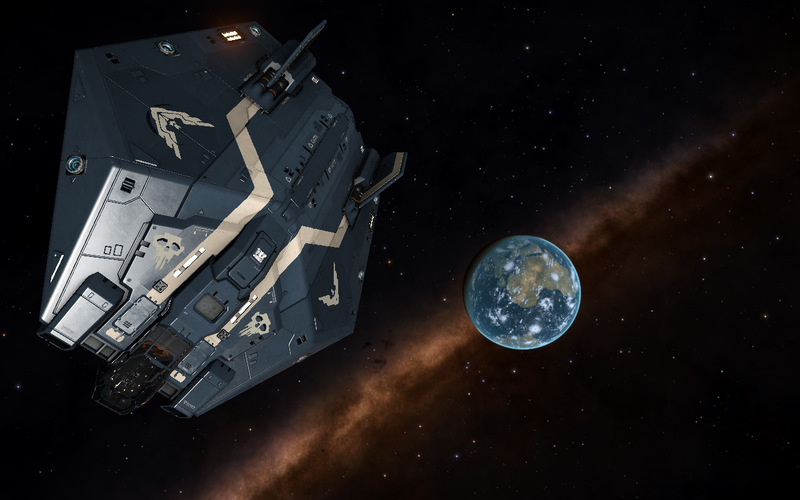 When I finally got him, he was in a Python with a couple of little escorts (Sidewinder & Eagle). I think he might have scratched my paint a little. Hrdina, you inspired me to buy an interdictor and take on a couple of assassination missions myself. And now I'm wanted in Alpha Centauri. At least, I was wanted when I logged off last night. I guess this is my chance to learn how the legal system currently works. Ha, I guess I should have specified that I only take assassination missions in Anarchy systems. 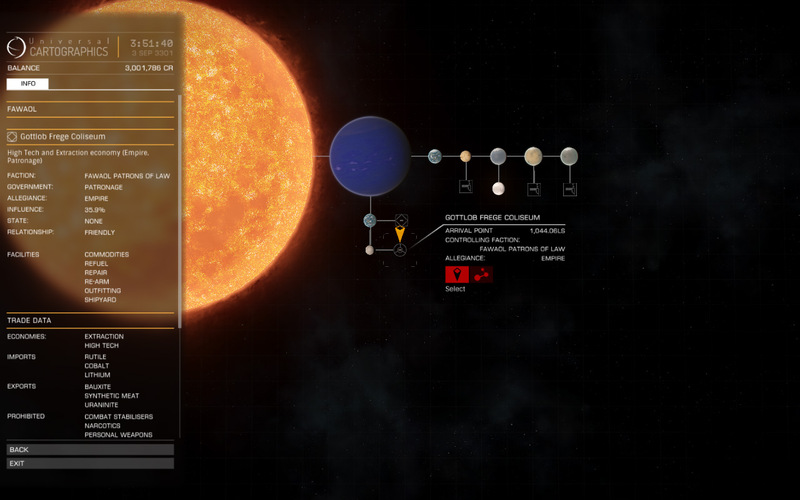 I did pick up a couple of bounties due to stray shots in Kill Pirate missions, but those are small and expire quickly. If you look on the Transactions tab (left panel) you can tell when a bounty expires. After then, it becomes a fine that you can pay off. So after the timer runs down, it works the way it used to? Two of the three targets from that round of missions were wanted, but the third, not so much. Not exactly. There are some weird rules about dormant bounties and whatnot that I don't fully understand. I haven't made a habit of getting bounties, although over the past two days I have. The Wiki page has some information about this. That's exactly why I only take assassination missions in Anarchy systems. You can shoot (and be shot by) anyone without criminal repercussions. 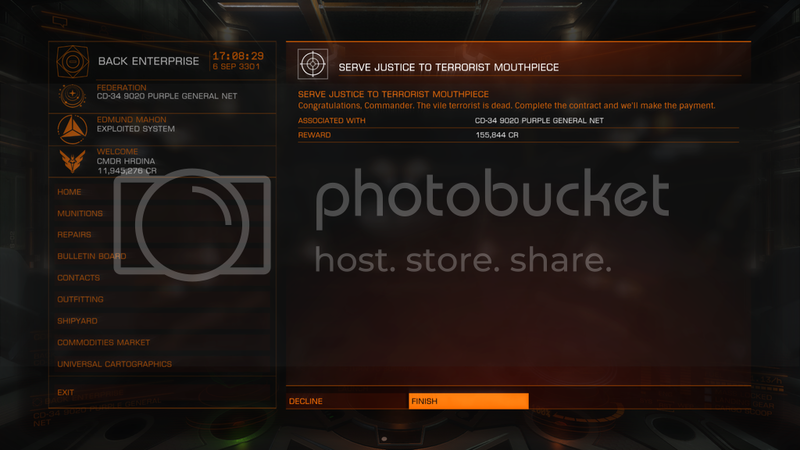 It is OK to take the "kill N pirates" missions anywhere, since the pirates will already have Wanted status.